For many people, the vibrancy of this evergreen climber tumbling from gateways, walls, balconies and roadside trees brings back memories of summer holidays in the Mediterranean. 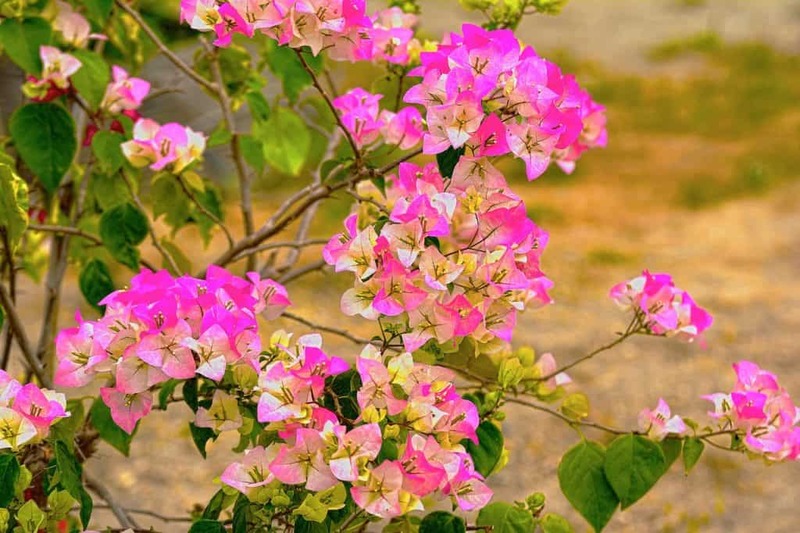 Bougainvillea was discovered in tropical and sub-tropical areas of Central and South America during a round the world voyage by the French explorer Admiral Comte de Bougainville in the late 1700s, explaining the plant’s tenderness and its name. Its popularity as a garden plant soon spread to many other parts of the world with a similar climate, and it is now a common sight in places as far afield as Spain, the Caribbean, the Pacific Islands, Australia and China. The petals of the Bougainvillea flower are tiny and inconspicuous, and generally white, and it is the flower’s papery bracts that give it the colour and long-lasting summer appeal. The most common varieties produce brilliant red or purple flowers throughout the summer and into early autumn, but a wide range of modern cultivars provide a broad range of colours and some will flower almost year-round under ideal conditions. Bougainvillea is not hardy in the UK. Very few people have had success with them in the garden, except on dry soils in sheltered spots against south-facing walls in the extreme south and the Channel Islands, or in the most sheltered of inner city heat islands, and even then only with the provision of additional winter protection. ‘Barbara Karst’ is said to be one of the hardiest varieties that is worth trying in these areas, though a harsh winter will always risk the plant’s survival. The varieties with white and orange flowers are significantly less hardy. However, the plants can be grown in a conservatory or in a container that can be kept in a sunny spot in the garden during the summer months, then moved indoors well before the first frost arrives. While they are best known as rampant climbers using their waxy thorns to scramble across and beautifully adorn arbours or walls, Bougainvillea plants can be grown as standards, hard-pruned bushes, in hanging baskets, as espaliers and other trained shapes, or even indoors as Bonsai plants. This article shows how gardeners can use Bougainvillea to re-create colourful Mediterranean memories in their own gardens in the UK. Some 300 varieties of Bougainvillea have been developed and registered, with well over 100 available from specialist nurseries in the UK. The wider family encompasses the familiar climbing bougainvillea that is covered in this article, but also dwarf types, bushy Bougainvilleas and even ground cover varieties. Only two species and one hybrid of Bougainvillea are generally cultivated and available in the UK and virtually all of the available varieties have been developed from these. The colour spectrum of Bougainvillea varieties ranges from white through pale apricot and orange to magenta, deep red and the most commonly seen purples. The purples and deep magentas include the popular Bougainvillea × buttiana ‘Poulton’s Special’, which has the RHS Award of Garden Merit, Bougainvillea ‘Braziliensus’ and Bougainvillea ‘Lilac’, which grows to a manageable 150cm height and spread. Bougainvillea ‘Amethyst’ and Bougainvillea ‘Alexandra’ produce paler purple flowers, and in favourable locations will survive temperatures down to 2°C. Pink to red varieties include the prolific and relatively hardy Bougainvillea ‘Tropical Bouquet’ and Bougainvillea ‘Double Delight’, which has unusual three-coloured variegated foliage and flowers with pink to pale red bracts. Bougainvillea × buttiana ‘Raspberry Ice’ has cream margins to its leaves and bright crimson blooms. Bougainvillea ‘African Sunset’ has some of the largest orange flowers of any variety, and others with orange to apricot-coloured flowers include the double-flowered Bougainvillea ‘Golden Dubloon’, the apricot-pink Bougainvillea ‘Rosenka’ and Bougainvillea ‘Miss Manillia’, with flowers that open a startling orange then change through apricot to pink. These varieties are likely to lose their leaves or even perish in temperatures below around 8°C. Bougainvillea ‘California Gold’ has large bracts of a pale gold colour and should survive temperatures down to around 2°C. Amongst the white-flowered varieties, Bougainvillea ‘Coconut Ice’ has attractive and variable pale pink tinges on the bracts, but for a truer white go for Bougainvillea glabra ‘Alba’, which has papery ivory white bracts with attractive pale green veining. Bougainvillea comes from sub-tropical climates and needs frost-free and warm conditions to survive. The main difficulty associated with growing them in the UK is that many varieties require minimum night-time temperatures of 10°C. Some will survive down to 2°C, though the cold may cause them to lose their leaves, and they effectively become deciduous. Most are large and vigorous climbers, so while they can be safely raised in a heated glasshouse or conservatory border, they do need a lot of space. They can also be grown in large containers that can be moved around the garden in summer, but must be brought indoors and kept frost free throughout the winter. Either way, the plants will require a trellis or pillar for support, and this should be taken into account when considering space requirements and the ease of moving containers around. Smaller varieties will be easier to manage in a container or more restricted indoor space, and they can be trained as a standard or spur-pruned to restrict size if necessary. Happy Bougainvilleas will flower over a long period. They should be grown in a very sunny position and kept warm. Once growing well in early May, the plant should be watered regularly and fed every week with a high-nitrogen fertiliser. Maintaining a high humidity will encourage flower buds to break. Once the bracts have opened and are in full colour, container-grown plants should be moved to a slightly cooler though still sunny location and indoor border plants should be protected from the midday sun with shading. This will help to prolong the life and colour of the flowers. Once blooming, the weekly feed must be changed to a balanced or potassium-rich fertiliser to encourage more flowers. Once the flowers have dropped, the plant can be cut back by about a half and a nitrogen-rich fertiliser used again to encourage more growth and flowers to form. Once the buds have formed, revert to potassium feed. With some loving care and attention, Bougainvillea can be encouraged to flower up to three times a year in this way. Bougainvilleas must be carefully protected through the winter. Well before the first frost, container-grown plants should be brought into a bright conservatory, garden room or heated glasshouse, where the winter temperature will not fall below 10°C. Lower temperatures may not kill a healthy plant, but it may drop its leaves for the winter. Throughout the winter until March, the surface of the soil or compost can be allowed to dry out, but the soil around the roots must remain moist. If the plant does drop its leaves, then watering should be reduced. Once warmer weather returns, containers can be taken outside, though it is worth waiting for expected daytime temperatures of 15°C and bringing the container back when night-time temperatures are expected to fall below 10°C. Watering and feeding should be increased, and this is the time to re-pot the Bougainvillea if this is really necessary. Bougainvilleas need a bright, sunny position throughout the year, but protect plants grown under glass from direct sunlight during the warmest parts of summer days when the sun is at its hottest. Bougainvilleas require frequent watering during the growing season, especially if grown in containers or with restricted root space. However, the soil must be free draining and the roots must not become waterlogged. Allow the surface of the compost or soil to dry out between each watering, but the soil around the roots below the surface should remain moist. The frequency of watering can be reduced outside the main growing season. They do best in a slightly acidic and well-drained but moisture-retentive soil. An annual application of organic mulch each winter will help to maintain good soil conditions, but do not use spent mushroom compost, as this will reduce the acidity of the soil. Bougainvillea is a heavy feeder and appreciates applications of appropriate fertilisers throughout the growing season. A cycle of using nitrogen- and then potassium-rich feeds timed to correspond with flowering is best, as outlined earlier, though for simplicity an alternative is to apply a balanced, controlled-release fertiliser at the beginning of spring and then again when the first flush of flowers is over. It is best not to move or re-pot Bougainvillea plants unless really necessary, as they prefer not to have their rather fragile roots disturbed. They do well when the root system is constrained, and re-potting will almost inevitably lead to reduced flowering for a while. If it is necessary to re-pot, use a new container that is only slightly larger than the old one and which has plenty of basal holes covered with broken crocks for free drainage. Use two-thirds peat-free potting mixture such as John Innes no 3 mixed with a third of horticultural grit. Many gardeners believe that Bougainvillea does better in terracotta pots, though this can leave them vulnerable to root damage if the pot is left in a fully sunny position through the height of summer, where it would require daily watering to keep the roots near the edge of the pot cool. A coir or similar pot liner will help to reduce any risks. When loosening the plant from the old pot and transferring it to the new container, try not to compress, disturb or damage the root-ball in any way, especially the fine mesh of feeding roots, as these are very vulnerable to injury. Bougainvillea is a really showy specimen plant that does not need any complementary companions to be at its best, though where there is space it will look most at home with similarly bright and cheerful sub-tropical species such as Oleander and Hibiscus: relatively hardy varieties of these are available, and if the position is suitable for Bougainvillea, it should also support them. Arguably, however, the best companions for a vivid purple Bougainvillea are an equally vivid red Bougainvillea and a beautiful white Bougainvillea! To keep Bougainvillea plants at their best they need a regular pruning regime. Firstly, they should be given a good annual pruning in early spring to get the plant back into shape. This needs to be completed before the new growth starts as Bougainvilleas form flowers on new wood. Take off at least half of the length of old stems and select the best to tie into the support once pruning is complete. Secondly, the plants should be pruned after each flush of flowers, to stimulate more fresh growth and blooming. They are vigorous growers, and with adequate feeding and care, pruning after each flowering cycle will not harm the plant: it will help to keep it tidy and in correct shape within the space allocated to it. 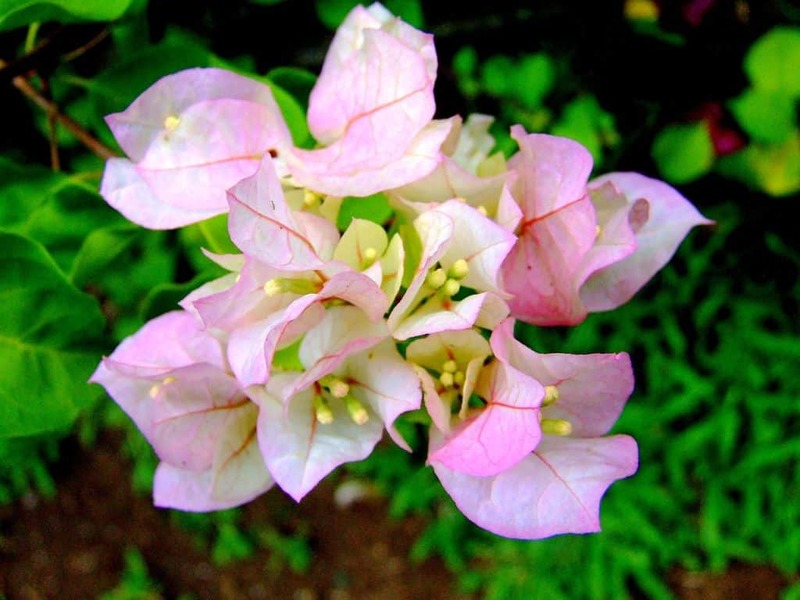 Bougainvillea is best propagated by taking stem cuttings or by layering. Both processes are relatively straightforward, and any problems tend to occur later when the rooted cuttings are transplanted from the nursery pots to their final positions, as they resent root disturbance. The new plants need warm, humid conditions to establish, preferably around 20°C. Regular misting with warm water will be beneficial. The young plants are likely to need two to three years to establish in their final positions before they will start to flower. Semi-ripe summer cuttings are lengths cut from the current year’s growth that has begun to mature, with some bark beginning to form on the stem. Use a sharp, sterilised knife to take a 15cm to 20cm piece of stem, strip off most of the leaves, dip the bottom of the cutting in hormone rooting powder, and place it into an individual pot of moistened, peat-free compost with a good handful of washed sand, horticultural grit or vermiculite mixed in. Place the pot in a bright greenhouse or cold frame, but out of direct sunlight. New leaves on the stem are a good indication that sufficient roots have formed to move the cutting on to its final position. Hardwood cuttings are taken from the current year’s growth later in the autumn, after it has matured and has developed bark. The same process can be followed, but the cuttings should be given some bottom heat about 5°C above the average air temperature to encourage rooting. Propagation by layering is achieved by bending a healthy, growing stem down to the soil, making a short incision on the underside of the stem where it will touch the ground, and then anchoring it into a shallow, watered trench using wire loops or a tent peg, and then refilling with soil to cover it. The best time to do this is early spring when the plant is just beginning to grow most vigorously. Once roots have developed, sever the plant from the parent with a sharp, sterilised knife and dig around the offspring to transfer as much of its undisturbed root system as possible to its final location. More control over the process can be achieved by layering directly into a pot of cutting compost. Using the container that will be the final home of the plant will avoid any root disturbance when the new plant is removed from the parent. Bougainvilleas are generally disease free and are not particularly vulnerable to pest infestations. In the UK, any problems are more likely to be related to sub-optimal environmental conditions. If the plant suddenly drops all of its flowers during the summer, or it an established plant fails to flower at all, this is more likely to be due to insufficient sunlight or over- or under-watering than to a disease. 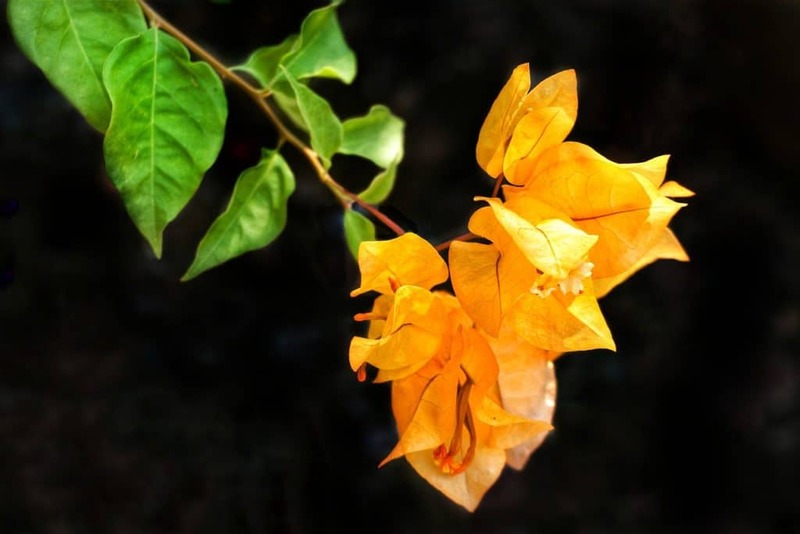 Bougainvillea can develop leaf yellowing, which is more likely to be due to nutrient-related chlorosis than a disease. A dose of dilute Epsom salts will help to reverse the problem while the plant is being brought back into a more favourable feeding regime. Sudden leaf drop will almost certainly be due to exposure to low ambient temperatures rather than a disease. However, Bougainvilleas in the garden are occasionally attacked by aphids, and mealybug, red spider mite or scale can be a problem, especially for plants growing in greenhouses and conservatories. A couple of sprays with diluted washing up liquid from a mister may help if the infestation is caught early, otherwise proprietary insecticides and organic solutions are available for indoor and outdoor use, though care should be taken outdoors to avoid impacts on beneficial pollinating insects. Q I would really like a Bougainvillea to remind me of holidays in Spain, but I only have a very small garden and conservatory. Any ideas please? Why not buy – or grow – a lollipop standard Bougainvillea? Use a 4l pot with good quality compost and lots of grit, and train the plant into a 1m high lollipop, rather like a typical bay ball. In fact, if you have two, you can use them as colourful and decorative guardians in a sunny position outside the front or back door during the summer, or around the patio, and then tuck them into a corner of your conservatory in the winter. Use a smallish and hardier variety; for a good and reliable purplish pink, Bougainvillea ‘Alexandra’ would be a good choice. Keep them well pruned to shape throughout the year, both before and after flowering, to maintain the lollipop and to keep the flowers coming.